This is the perfect Autumn Soup — it’s warming and nourishing (thanks to the turmeric and chicken), but also light and zesty (thanks to the lemon and dill). So it is the perfect combination for those (like me), that are trying to gently ease themselves into the colder weather without going full on with a onesie-hat-slipper ensemble. Now, let’s talk for a minute about all of the nutrients in the soup — for those of you that follow my recipes, you will already be aware of my love affair with the super-spice turmeric. It is a powerful anti-inflammatory and a very strong antioxidant, and I try to use it in as many recipes as I possibly can without turning the whole house yellow! The powerhouse that is Spelt provides complex carbohydrates for slow release energy, protein, tons of fibre and many health-boosting micronutrients. Instead of using chicken or vegetable stock, I used bone broth instead, and not only did it add wonderfully to the flavour, it upped the “goodness” value no end! Bone Broth is rich in minerals that support the immune system and contains gut healing compounds that can reduce intestinal inflammation. One serving provides 340 calories, 43g of good quality protein, 6g of fibre and 35% of my daily Vitamin C requirements. · Mince the garlic cloves. · In a large saucepan, heat the olive oil and fry the onions, leeks and celery for 4–5 minutes until clear on a medium heat. · Add the garlic and sauté for another minute. · Add the chicken stock and the bone broth and turn down the heat. · Add the turmeric, lemon juice, dried dill and season with salt and pepper. · Add the chicken thighs and cook for 15 minutes until they are cooked through. · Remove the chicken and set aside to cool slightly until you can tear the chicken into little pieces. 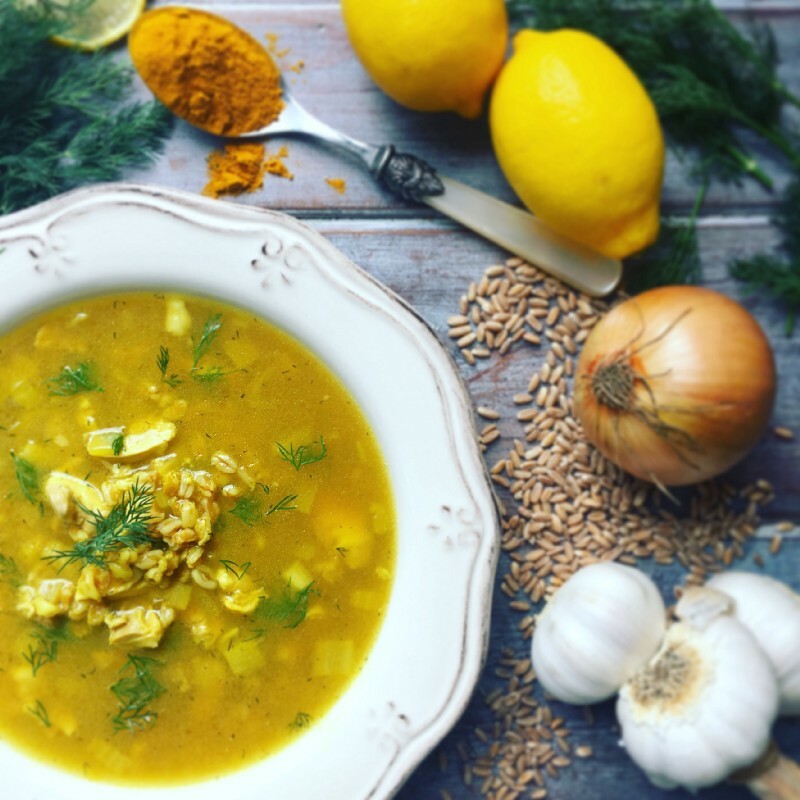 · Once the spelt is cooked, add it to the large soup saucepan along with the chicken pieces, lemon zest and fresh dill.